Bacon, Onion, Fig Jam Anyone? 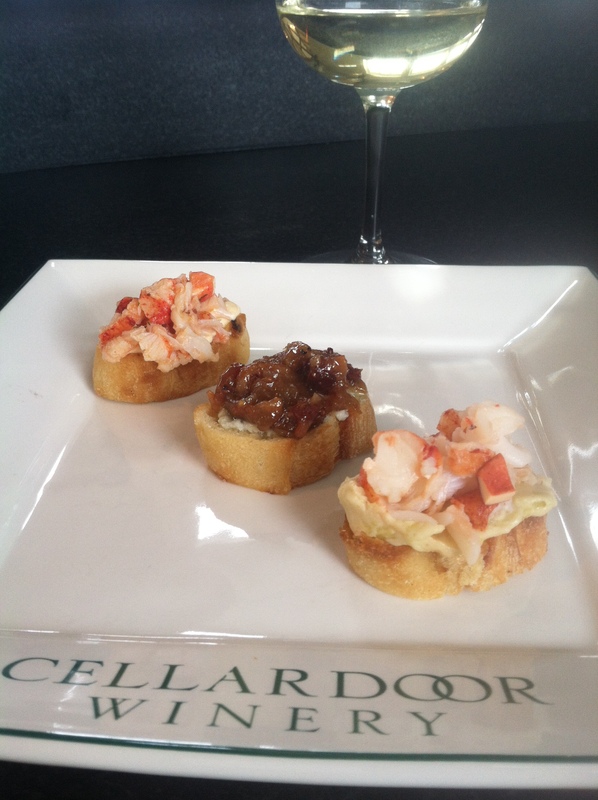 So this past Sunday, I did a food and wine pairing at Cellardoor Winery in Lincolnville, Maine. It’s a gorgeous vineyard with a stunning farmhouse, tasting room and dining area that makes you feel like you must be in California wine country. But we’re in the beautiful state of Maine. With delicious wines. I love this place. I was very excited to be cooking some bites to pair with their wines for their regular pairings on Sundays. Sauté onions with butter in large saucepan over medium-low heat until they begin to brown, about 45 minutes. While the onions are cooking, cook the bacon until it’s just shy of crisp, you want some “bend” to remain (about 80% done). Then add to the onions, adding some of the grease, but not all. Then stir in remaining ingredients and simmer on low for about 20 minutes. Taste after about 10 minutes. If it’s not sweet enough, add sugar. If it’s not tart enough, add more Balsamic. If you want more mustard for more of a savory kick, add more. This is where you cook to your taste! Blue Cheese Butter (I used Gorgonzola) 8 ounces of blue or Gorgonzola cheese 1/2 stick of butter Let cheese and butter sit at room temperature to soften. Mix with paddle attachment in stand mixer or food processor (or by hand!) until well combined. Baguette slices (fresh or baked until crisp) Top with blue cheese butter and a spoonful of bacon jam. It’s a perfect couple of sweet-savory bites! But we all agreed, pair it with a nice bold, fruit forward red! Oh, and by the way, the other two bites were Maine lobster…….stay tuned for those recipes! I'm a cookbook author, guest chef instructor at Stonewall Kitchen, food blogger, wineaux, chocolate addict, convertible driver, optimist, amateur photographer and full time broker selling B&Bs. I love foie gras, crusty bread, cheese, champagne and flip flops.